On the View All Requests tab, there is an button titled, "Message Customers". This functionality allows you to send an email about a service request to the service request owner. Click on the "Message Customers" button to open the Message Customers window. There are three data points required to message customers from a service request. Select a date range for requests, select request by a keyword search, OR select requests by status (or state). Only one of these elements is required. 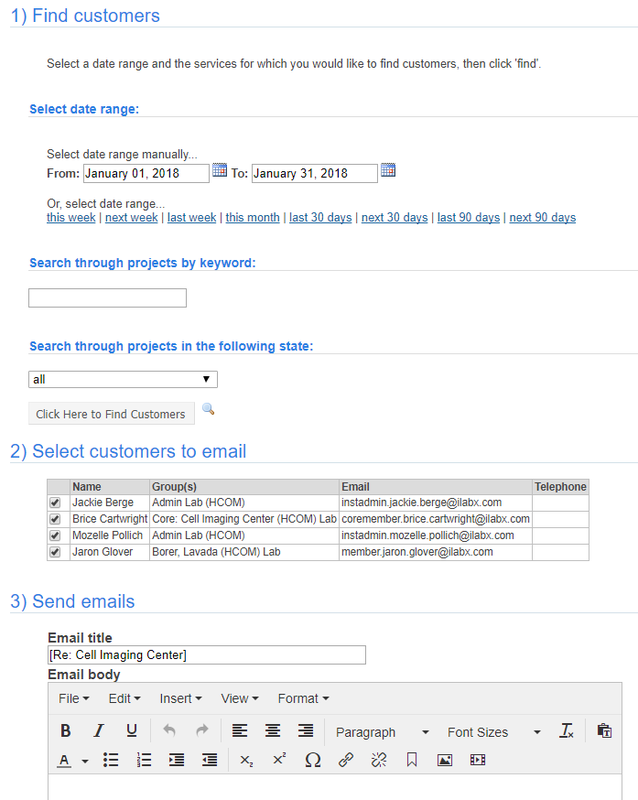 Select a date range: Enter a date range for the requests for which you wish to send an email. Or, you may choose to select a pre-designated range, including "this week", next week", "last week", "this month", etc. Search through projects by keyword: You may choose to select projects by entering a key word; for example, a project name. To do so, begin entering the keyword and appropriate results will display. Click on a project to select it. Search through projects in the following state: Use the drop down box to select a specific service requests status to search. Now, click the "Click Here to Find Customers" button to display all the service requests that fit your search criteria. Select customers to email: Check the box to the left of the customer(s) name to select who should receive the email. Send emails: Enter an email text then select "click here to send emails". When you have finished entering your data, click on the "Click here to send emails" button.